Seriously, I was not 100% certain about what I was doing, or if I was doing everything the right way. No one taught me dressmaking before. Luckily, the Internet, a number of Craftsy classes, and a bookshelf of sewing books gave more than enough resources to guide me through making my first blouse. Yes, I am the kind of person who "collects" sewing books and patterns even though I don't sew very seriously. I just love the subject of sewing and admire the beauty of couture. But still, I wish I can have someone checking out my sewing, helping me out through the fitting process, and advising me on how to make my work better and faster. The pattern is vintage MaCall's 8194. I think it's a 60s design. There is no date printed on the envelope. I got it from the Workroom several years ago (perhaps in 2009), back in that time there was a box next to the window full of vintage sewing patterns. The box is not there anymore. It's most perhaps the easiest pattern I have at hand: no set-in sleeves, no button holes, no linings, and very straightforward Peter Pan collar. So, although the size is bigger than my body measurements, I decided to give it a try. 1. Narrowed the shoulder by two inches. 2. Lowered the bust darts by 1 inch. 3. Reshaped the shoulder line for my sloping shoulder. 4. Replacing the invisible back zipper with a slit opening on top. 5. Redrafted the collar because strangely the original version is kinda too tight for the neck (the drafting is based on the Bunka Garment Design Textbooks from my collection of sewing books). 6. Substitute neck facing with bias strip binding. It's a lengthy, trial-and-error process for someone like me who had never done this before. I felt so frustrated! Somehow, I was able to waddle through the process and have the actual sewing done. It's a miracle! I am very proud myself (being not given up). The floral fabric is obviously Liberty Tana Lawn, from my quilting fabric stash. 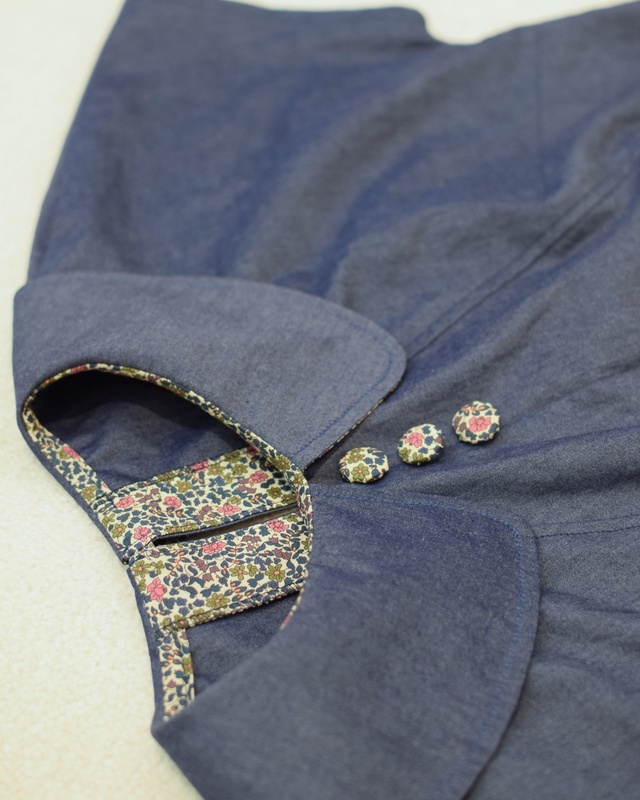 The body fabric is a somewhat tightly woven cotton chambray from a local store called Sultan's Fine Fabrics. Their warehouse is amazing! So big, so many fabrics, and to hard to choose what to buy! 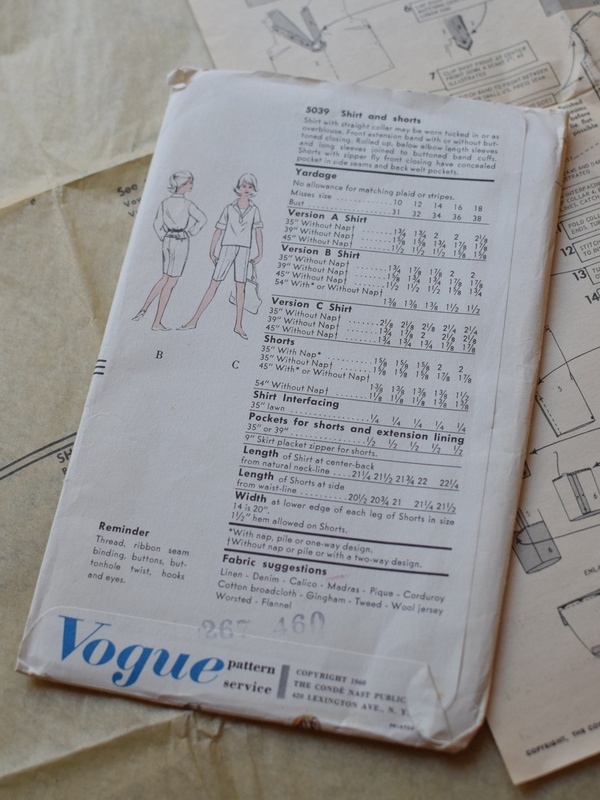 I am looking forward to making the next blouse, another vintage pattern of 60s design. I love vintage patterns that they have both the cut line and seam line printed, and only one size is printed per envelope. But the fact that I will have to go through the instructions so tinily printed is intimidating. Well, dealing with equally horrible construction drawings and shop drawings have been my routine work in the office, so hopefully I will be fine.